Having three kids of my own, I know how wonderful it is to have them with me on Mother’s Day. But for my parents and siblings, we're scattered in Connecticut, Pennsylvania, Florida and New York. So this year I thought it would be fun to get together virtually, using group video chat. For us, the easiest application is Skype. We all already have Skype loaded on our computers and iPhones for free one-to-one video chat. To set up a group call, we need to purchase a Skype Premium subscription—for $4.99 a day or for $8.99 per month (you can also try it for free for 7 days). Then it’s simply a matter of placing a call to mom and then adding in my brother and sister. If everyone is on Facebook, there is a free option called SocialEyes. First you install SocialEyes, then you invite your family to install the SocialEyes as well. 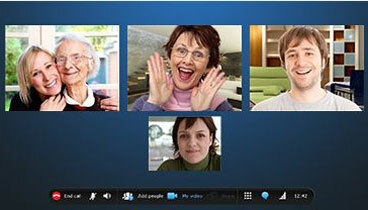 When you’re all logged onto Facebook and running the SocialEyes app, you can create a call between up to six people. SocialEyes doesn’t work when you have the “Secure Browsing” feature turned on (which we recommend in our Guide to Facebook Privacy Settings), so turn it off temporarily for your chat. Logging out and logging back in again after your chat will re-establish a secure link. For smartphone users, there’s another free group video calling app called Fring. This app connects up to four people and runs on Android devices and Apple iOS 4 devices with front-facing cameras. The app works best when all devices are using Wi-Fi, but the quality is tolerable on most 3G and 4G networks as well. So make a virtual date on Sunday to get all the kids together for Mother’s Day. Your mom will love you for it (not that she doesn't love you already)!